· To ensure that there is a process in place to outline access to the recorded proceedings of Council. 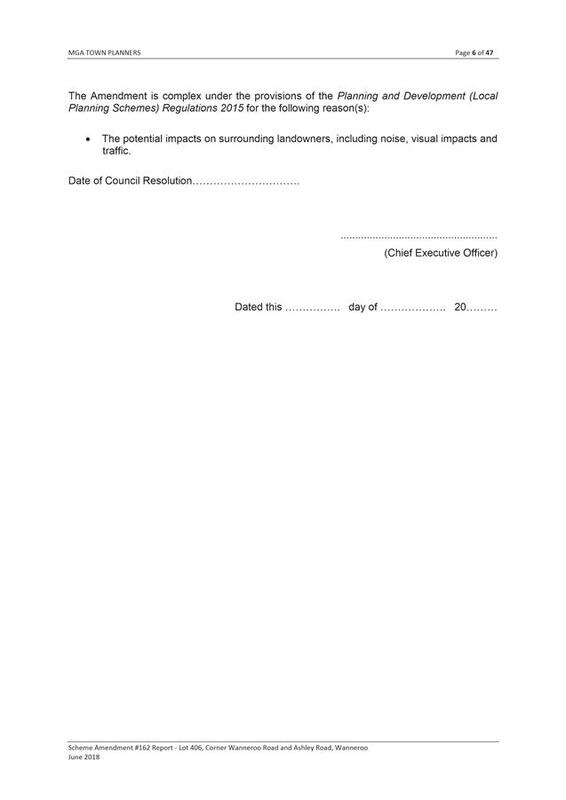 · To emphasise that the reason for recording of Council Meetings is to ensure the accuracy of Council Minutes and that any reproduction is for the sole purpose of Council business. (1) Proceedings for meetings of the Council, Electors, and Public Question Time during Council Briefing Sessions shall be recorded by the City on sound recording equipment, except in the case of meetings of the Council where the Council closes the meeting to the public. (2) Notwithstanding subclause (1), proceedings of a meeting of the Council which is closed to the public shall be recorded where the Council resolves to do so. (3) No member of the public is to use any electronic, visual or vocal recording device or instrument to record the proceedings of the Council or a committee without the written permission of the Council. (4) Members of the public may purchase a copy of recorded proceedings or alternatively listen to recorded proceedings with the supervision of a City Officer. Costs of providing recorded proceedings to members of the public will be the cost of the recording plus staff time to make the copy of the proceedings. The cost of supervised listening to recorded proceedings will be the cost of the staff time. 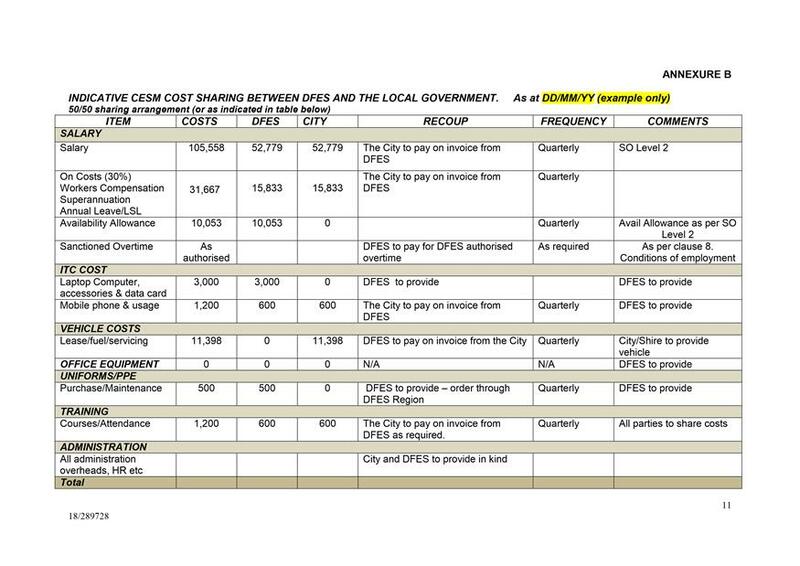 The cost of staff time will be set in the City's schedule of fees and charges each year. 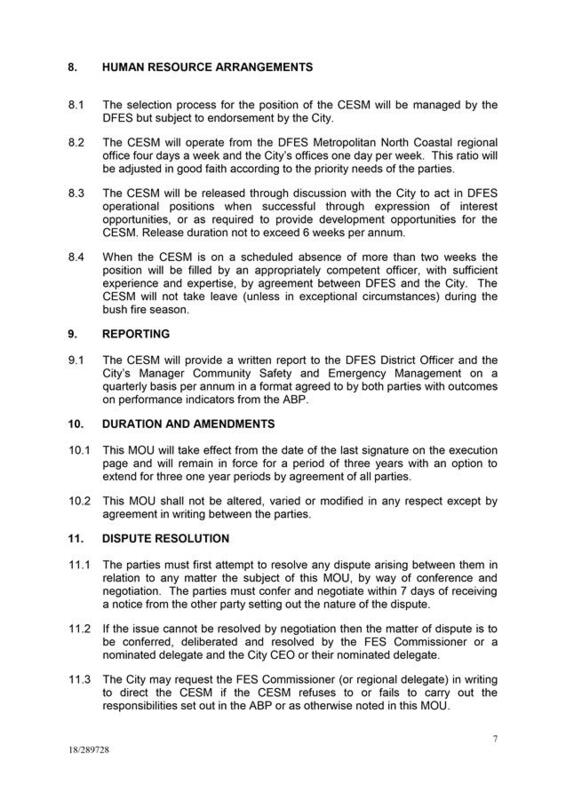 (5) Elected Members may request a recording of the Council proceedings at no charge. However, no transcript will be produced without the approval of the Chief Executive Officer. All Elected Members are to be notified when recordings are requested by individual Members. (6) Recordings pertaining to the proceedings of Council Meetings shall be retained in accordance with the State Records Act 2000. (7) This policy shall be printed within the agenda of all Council, Special Council, Electors and Special Electors meetings to advise the public that the proceedings of the meeting are recorded. Mayor Roberts declared the meeting open at 7.00pm and read the prayer. Please refer to agenda for details of full reports and attachments. That Council GRANT a Leave of Absence to Cr Hayden for the period 21 August to 4 September 2018 inclusive. There were 16 members of the public and one member of the press in attendance. We are residents of Pearsall, close to Voyager Park, the subject of our comments. In the three years we have lived here, we have never seen development or maintenance of this bush area. Voyager Park most recently has become a dumping ground for rubbish over and above the usual litter. The litter itself is starting to affect the growth and blooming of native wildflowers, and we have personally cleaned up the area and taken the litter home to our rubbish bin. Our flora and fauna in this tiny park are suffering from CoW's neglect. 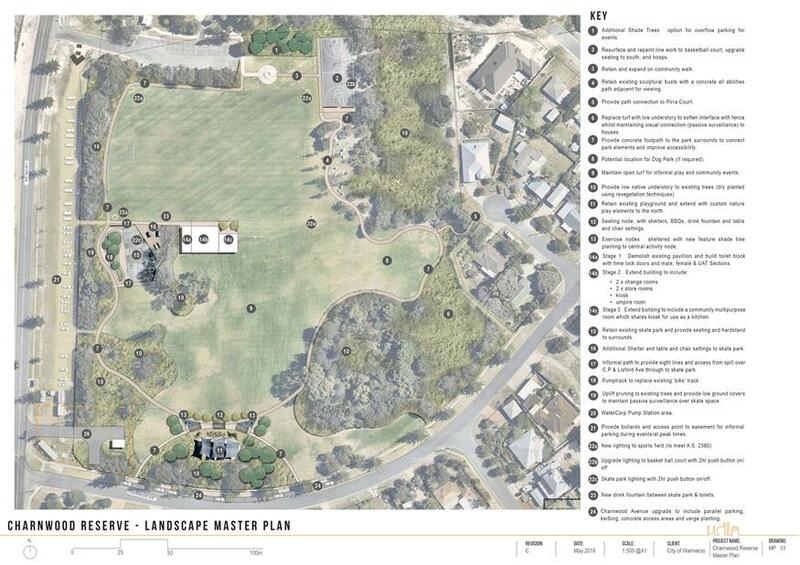 We feel if a pathway could be constructed with rubbish bins at either end, residents might enjoy the park more without tripping over bottles and cans and the animals could forage for food other than human garbage. Voyager Park in Pearsall is maintained as a conservation reserve. Administration is currently assessing a number of concerns raised by local residents at the reserve including fire mitigation management, general rubbish collection and a request for bins to be installed. Rubbish collection was conducted last week within the reserve where general litter was collected and removed. Some bulk rubbish items were identified on the verges and these items will be removed during the upcoming bulk uplift in Pearsall. The City's Fire Protection Officer has inspected the reserve and advised that there is not enough fuel load build up to justify a fire mitigation burn; however Administration has scheduled targeted Veldt Grass spraying over the next month along with the removal of a number of fallen branches. 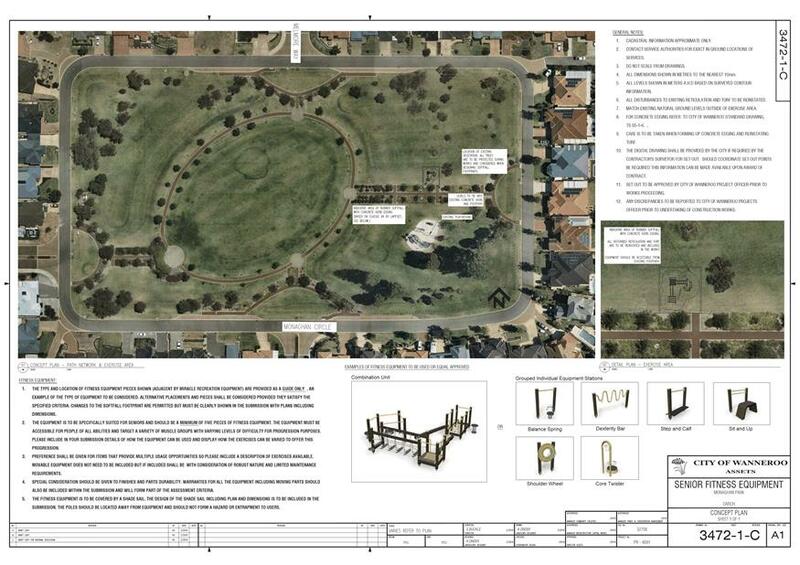 Voyager Park does not qualify for bin installation in accordance with the City's criteria used to assess the need for bins in parks and reserves. However; Administration will work with local residents to formally register their interest as a 'Friends Of' group and work with the group moving forward in the management of Voyager Park. 1. Were Elected Members made fully aware of the bottom line impact this change to the rating method would have on pensioners? The 2018/19 budget was developed by the Elected Members through a series of Workshops which commenced in February 2018. In addition to these Workshops two reports were presented to the Elected Members, the first being on the 8th May and the second on the 5th June 2018. As part of the workshop process Elected Members noted there was a risk associated with abnormally high increases in waste management driven by the State Government Waste Levy, and increasing landfill costs of approximately $4.5m. The impact of these increases on rate payers and pensioners in particular was discussed at length, including giving impacted pensioners a discount on the waste charge. 2. Why didn’t the City provide any prior notice to pensioners of this change to the rating method? The Local Government Act requires Councils to give notice of certain rates within two months of the commencement of the applicable financial year and to allow invitation for submissions within 21 days of this notice being given. Council endorsed the proposed rates at the Council meeting held on the 1 May 2018 and these were advertised on the 8 May 2018. As the budget was not endorsed by Council until 26 June 2018, the budget was draft and unapproved until that time and it was therefore not possible to give rate payers advance notice of this change. Information about rates was available on the City’s website immediately after Council endorsement of the 2018/19 budget which included FAQs and information about Pensioner Rebates. A Flyer explaining the calculation of rates, payment arrangements, Pensioner Rebates and waste charges was included with rates notices which were posted to rate payers early August 2018. Given the impact on Pensioners Rebate of separately charging the cost of waste to General Rates, Elected Members introduced three tiers of waste charge for 2018/19 providing a discount to Pensioners of up to $98. In addition pensioners have the option of paying their rates weekly, fortnightly, monthly or any other frequency that suits their budget and these payment arrangements do not attract interest or fees. Traffic flow management within the Regent Waters estate. A Funeral Home has been approved on 607 Wanneroo Road. 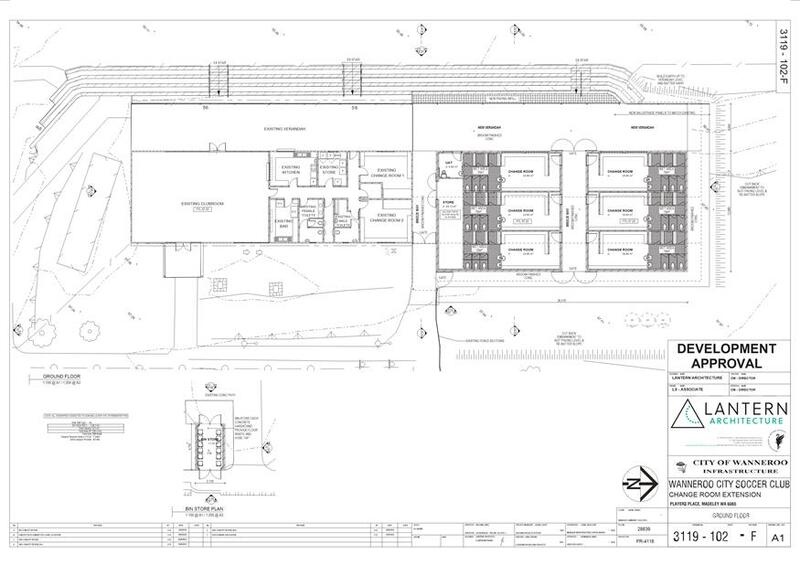 That application was placed 1-2 years ago, back then it may not have been envisioned that the building has now been denied access by Main Roads via Wanneroo Road, so that this business can now not access to or from Wanneroo Road. They will now have to access via Mangano Place, a side road which also allows access for the caravan park with over 100 residents. The funeral home are expecting 3 services a day including weekends with up to 50 cars each service. They have been attracted to that site due to the location and the parking, now all traffic will need to turn left on to Mangano Place then right onto Villanova Street to exit onto Wanneroo Road, Main Roads has denied access to turning right. So 100 cars will not be able to turn right , so will need to turn left, proceeding 100m up the road and then do a U-turn and come back down. More likely they will come down Backshall Place instead which is through residential suburbs and will then be looking at hearses and their support vehicles. The application was submitted to the City late last year and it was approved in May this year and was referred to Main Roads as part of the process and Main Roads did required that the existing access onto Wanneroo Road be closed. This would have been a requirement anyway due to the intersection upgrade. Administration was only made aware recently that the right turn out of Villanova will no longer be possible. The application was dealt with at the time and granted approval. In regards to the traffic movements on Villanova Street, Administration had met with Main Roads and attended a Construction Reference Group meeting with some community members as well. Main Roads has indicated that right turn movement out of Villlanova Road on to Wanneroo Road will not be possible safely and are considering a U turn. This will be subject to a detailed design and Main Roads will be appointing a design/construct contractor after the procurement process; and during the design phase will be looking at all the possibilities including U-turn. Administration has asked Main Roads to look at the impact of the grade separation on several intersections in the area including Backshall Place and Ocean Reef Road and awaiting the outcomes. 2. Main Roads have provided a letter stating that they are not going to alter any of those intersections, Backshall Place, Villanova Street, Clyde Crescent, James Spiers Drive. 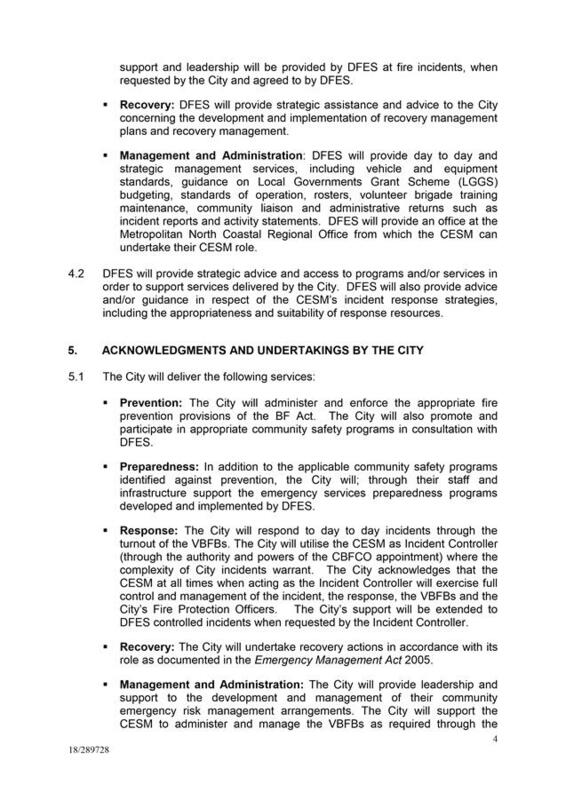 It is the City of Wanneroo’s responsibility , so why is the City going to Main Roads for remedies in that area? On a daily basis residents face on-coming traffic from Ocean Reef Road. Now, in addition to this there will be added additional traffic due to the future bridge construction and the funeral home. The City of Wanneroo needs to act now on the traffic that will be generated. Administration has raised the matter with Main Roads during their project development phase of Ocean Reef/Wanneroo Road grade separation as we considered that there are concerns about the impact on local intersections. There is a potential for traffic to increase from Backshall Place exiting onto Ocean Reef Road and have asked Main Roads to model the traffic analysis on what is happening now and what impact that grade separated intersection will make. Given the circumstances that have arisen since the approval, are there any concerns on the impact of not being able to turn right onto Wanneroo Road? They are valid concerns and Administration needs to see if there are solutions and work together with the Director, Assets going forward. The approval was issued in good faith at the time there was no intention at that time it was approved to restrict the right turn. Concerns about traffic and not being able to turn right on to Wanneroo Road. Turning left into the residential area. Funeral home will park on side of road and cause traffic hazards. 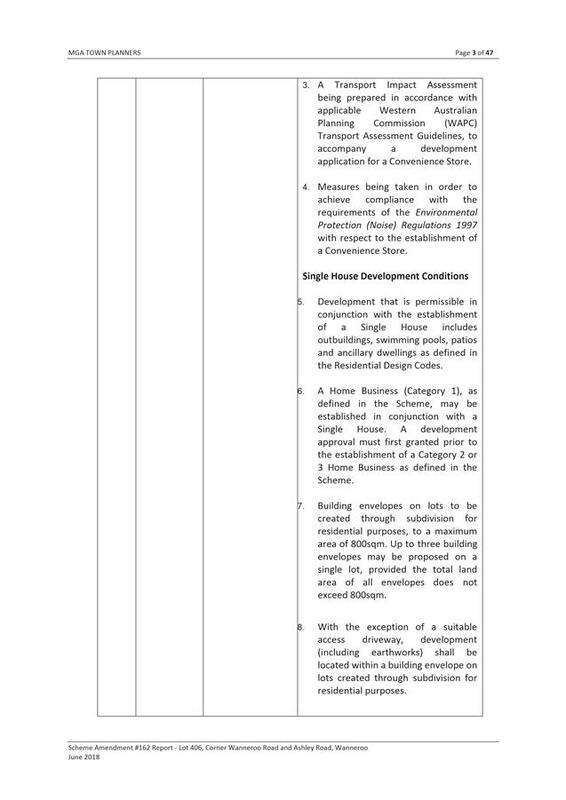 It was approved under the discretionary use under the scheme in the service industrial zone when it was assessed it was considered to be compatible with that zone and there was no requirement for it to be advertised. Given the concerns over the road, which is a Main Roads road I will write to the local member of Wanneroo to look into this. 1. Up to 275 truck movements down Meadowlands Drive with increase dust and congestion and possible traffic accidents at the intersection of Meadowlands and Neaves Road. The Silver Road realign will still have issues. The mining truck drivers are of concern. We were first notified of the mine in January 2018 by Urban Resources via a letter. A petition was lodged with the City of Wanneroo in May 2018 to designate Meadowlands Drive as a local road only. In 2015 the City of Swan had a similar case against Urban from 40 to 160 truck movements per day, the Tribunal dismissed this application. Is this not the same issue we are facing by allowing up to 275 truck movements per day along Meadowlands Drive? Did the City of Wanneroo receive any application for the sand mine? If the sand mine uses Meadowlands Drive as the truck access route can the City restrict the truck movements to 40 per day? Ask Main Roads to undergo a review of the current road speed limits on Meadowlands Drive and Via Vista Drive. Administration cannot restrict the use of the trucks on the road up to 19m. The signage is only local traffic signage and not what type of vehicles can enter that road. The current default speed limit is 110km and the traffic data has showed that the traffic driving along the road is in the mid 60kmph, so we will be asking Main Roads to consider changing the speed limit. I have written to the minister and asked that a meeting be held with local residents. Be held and received a response and sent another letter a week ago, requested again for a public meeting. There are a number of Government agencies involved in this application. In 2014 there was an informal meeting and Manager Approval Services will provide additional information. 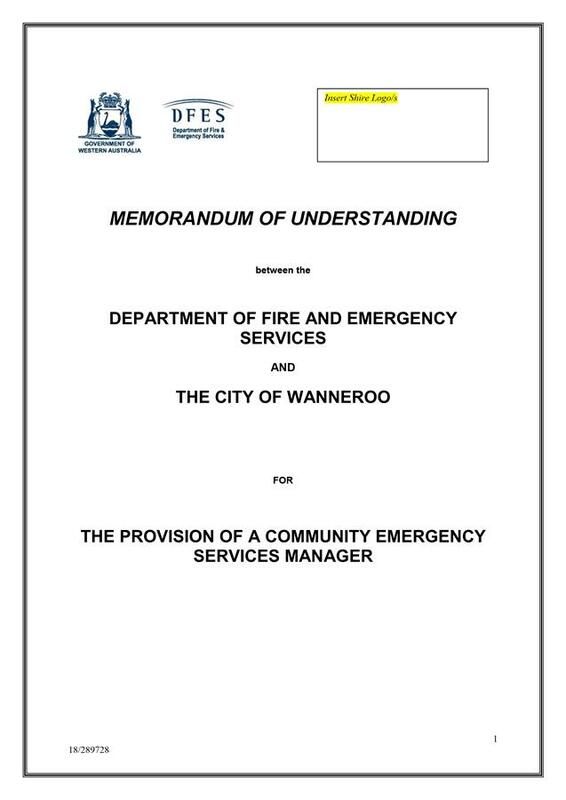 Urban Resources did meet in 2014 with the City of Wanneroo and was advised to undertake consultation for the application of the sand mine. 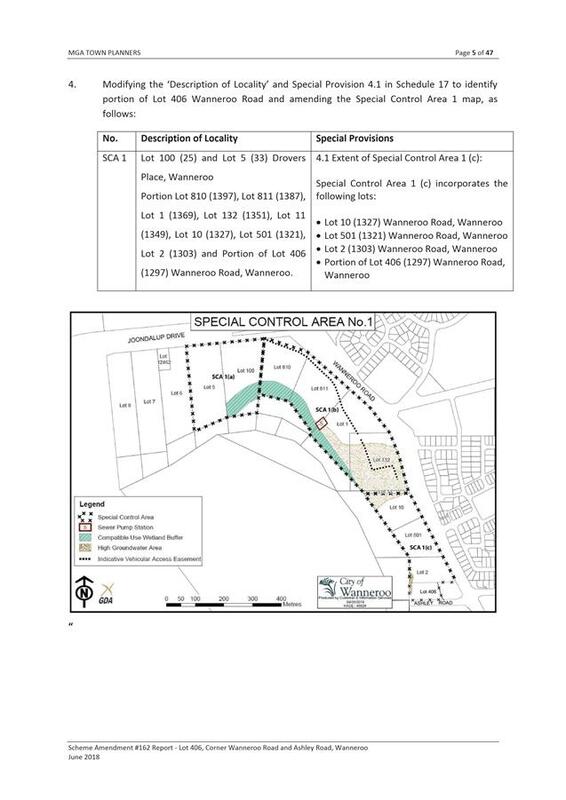 The application was then lodge with the Department of Mines, they process and dealt with this application and issued the approval without the City of Wanneroo’s or residents knowledge. 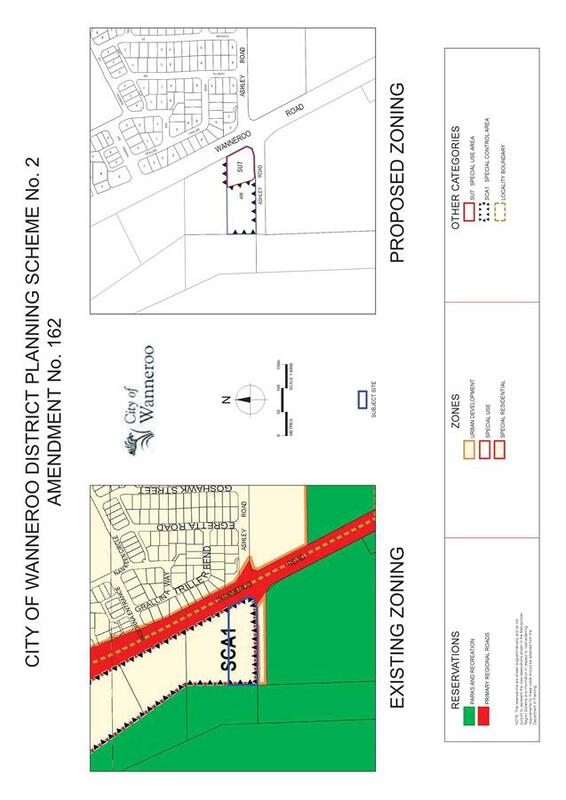 The City of Wanneroo was only aware of the approval last year when Urban Resources came to discuss the traffic and road upgrades. It was indicated then that further consultation with residents should take place. 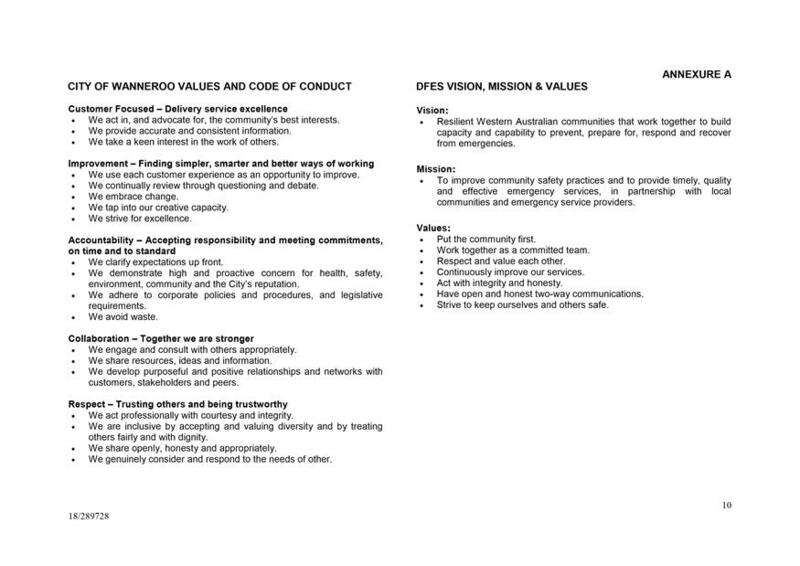 This application was not endorsed by the City of Wanneroo, we were only made aware in 2017, and since have sent letters off to the three Ministers. 2. 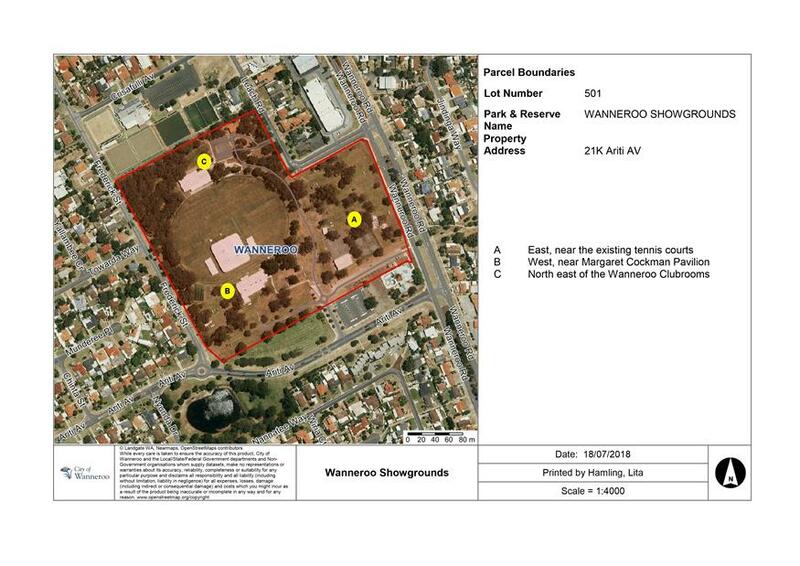 Is the City of Wanneroo going to back the residents and decrease trucks to 40 per day? The trucks cannot be restricted uncles they are larger than 19m. Understand the frustration. We were not the approving authority, this was a State Government agencies. Is this report time sensitive? If this report is to be referred back to do further assessment to support the local residents are best we can, are there other opportunities that can be explore? At this stage a conversation with Urban Resources indicate that they are only planning to use trucks smaller than 19m. If the report is referred back to Administration, then the City can contact the City of Swan to better understand the planning context of the example Ms Capes is referring to. That the minutes of the Ordinary Council Meeting held on 24 July 2018 be confirmed. Regarding Lots 28 and 29 Belgrade Road, Council has supported this project but Administration seems to be working through some processes. 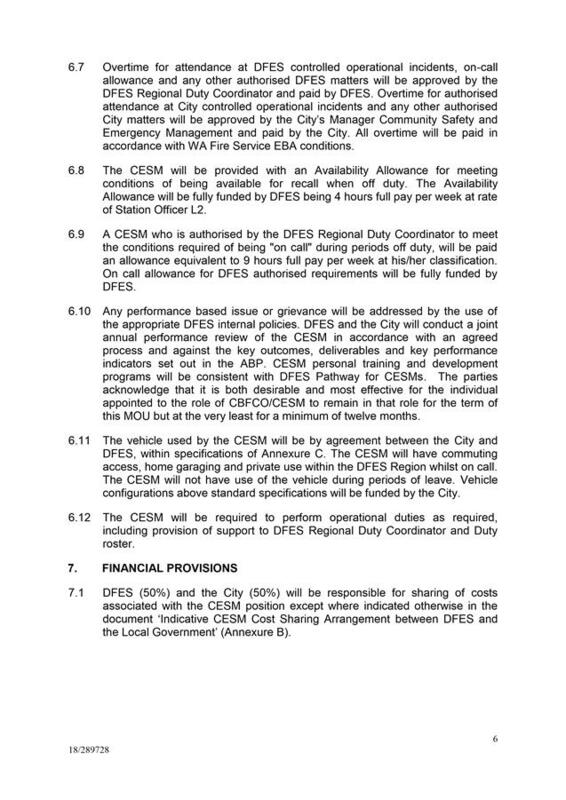 Council expected to see this item, amendment No.163 included in tonight’s meeting. 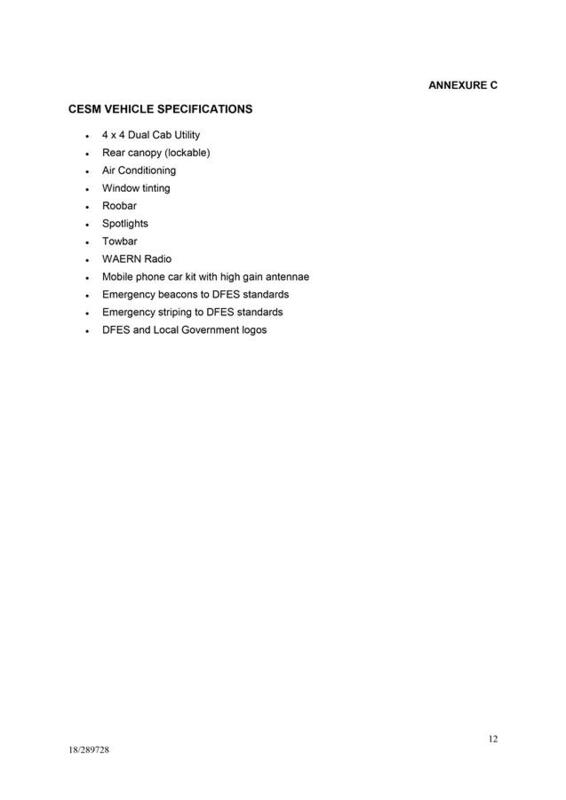 Can Administration advise why this item has not been included tonight? When it will be presented to Council for a decision? The Director Planning and Sustainability has provided regular updates to Elected Members continually on the progress of this matter and the timing and decisions that are required to progress to Council which is in the support of the intent of the Council resolution. The most recent advice was circulated on 17 August 2018. There have been 4 meetings with Administration and land owners and representatives to progress the Council’s resolution. Administration has provided some information to the landowners in reaching an agreement. The landowners made it clear they did not want any agreement with a caveat over the title and preferred a dollar figure. Administration has put together the best possible figure based on the information it has. Administration has requested more information and are waiting for that, and anticipate it should be received within the next week and put to the next Council meeting in September. CQ02-08/18 Cr Newton – Meadowlands Report. As there is an indication that the Meadowlands report may be referred back to Administration, is it possible for Administration to write to Main Roads about the speed limit rather than wait, so we can get an answer before the report is presented to Council again? Yes we can do that and include the response in the future report. 1. 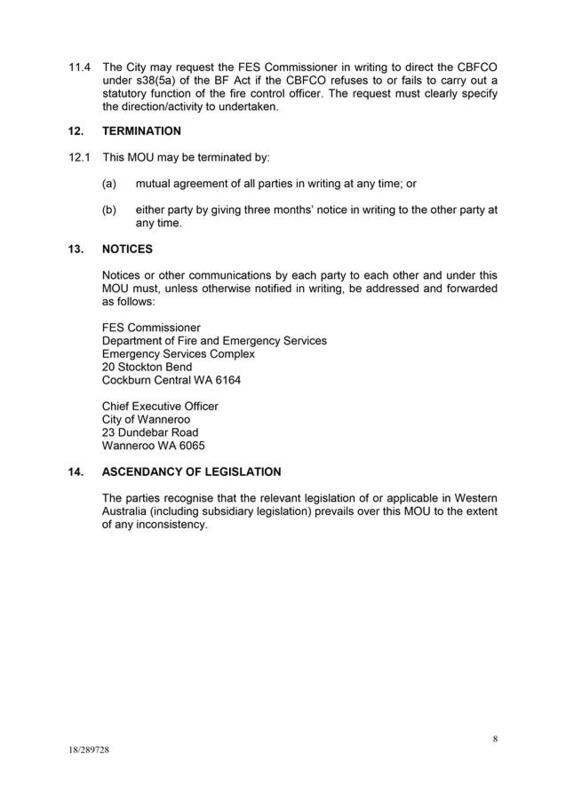 I have given Administration information about the City of Swan, as they did restrict the truck movements via a SAT order, can Administration follow up on the information that was provided by me? The City of Swan circumstance was that the application was submitted to the City of Swan and they were the responsible authority. This case was approved by the Department of Mines and there was no appeal as the application got what they wanted. The City was not involved in any discussion or negotiations about truck movements. 2. Mayor as you suggested that you will write to Minister, please can you advise which Ministers – Roads or Mines? 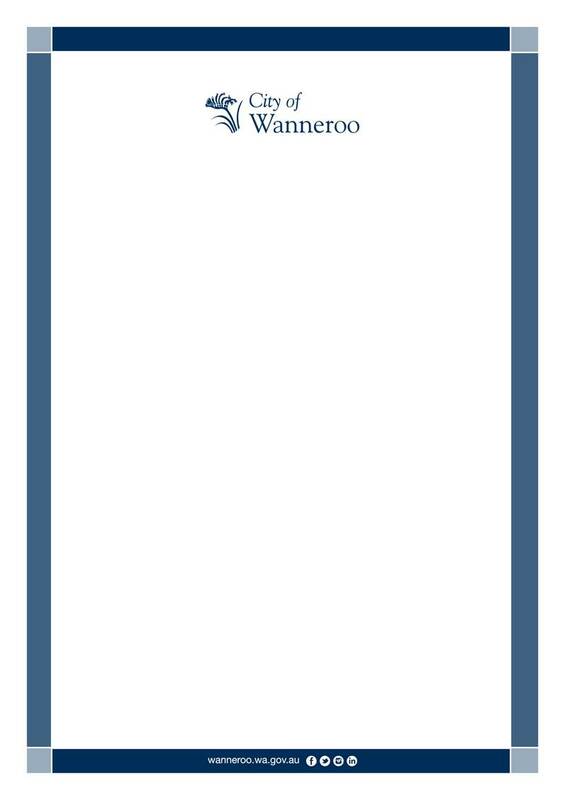 There are 3 Ministers involved so I’ll write to all the relevant ones and the member for Wanneroo. 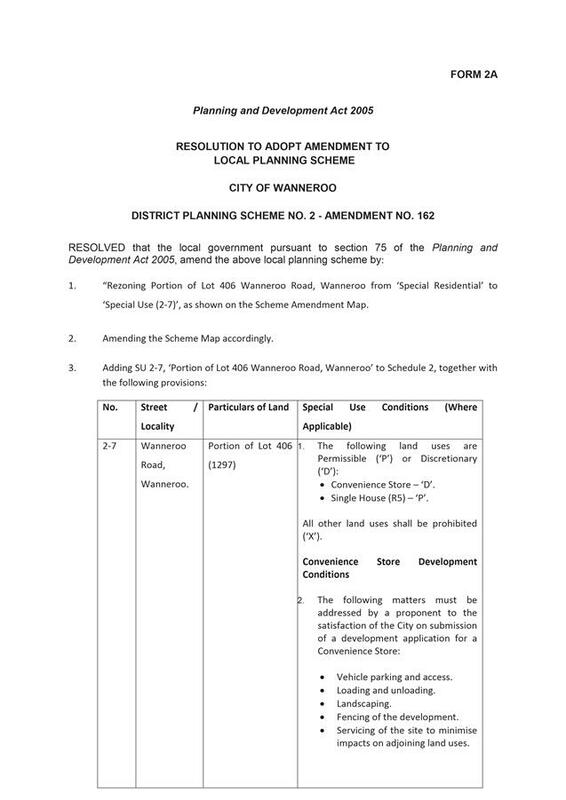 The Funeral Home that has been approved, now that Villanova Road has no right access, I am concerned about U-turns on Wanneroo Road, what impact would that have? Has Administration spoken to Main Roads about re-opening Calabrese Road at East Road? Yes we have held conversation with Main Roads to provide traffic modelling on how the U-turn facility will work. We are yet to receive that information. Cr Coetzee presented a petition of 153 signatures supporting a proposed child care centre at 10 Harbour Elbow, Banksia Grove. (HPE 18/300880). 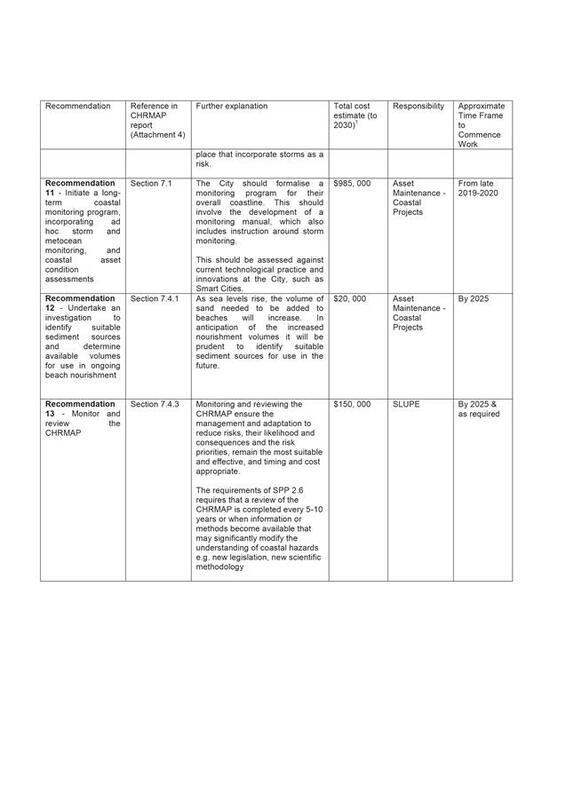 That petition PT01-08/18 be received and forwarded to the relevant Directorate for reporting back to Council. 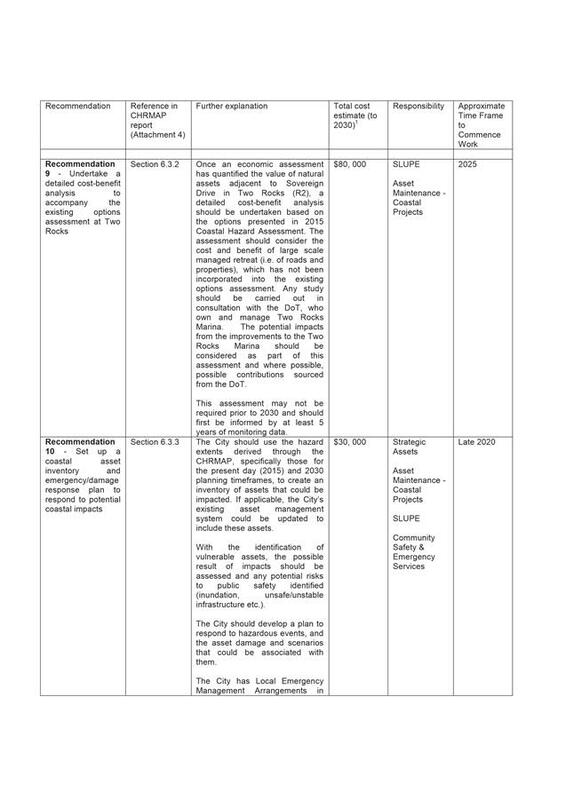 Declarations of Interest by Elected Members, including the nature and extent of the interest. 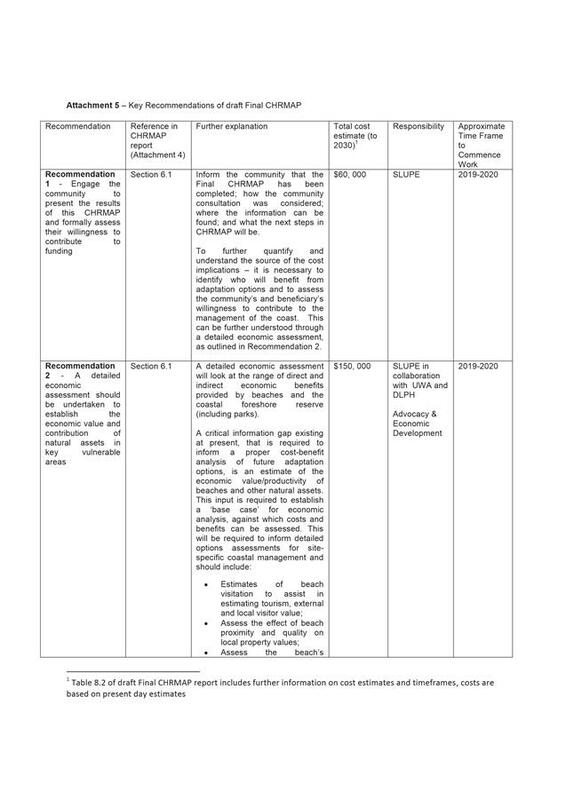 Declaration of Interest forms to be completed and handed to the Chief Executive Officer. 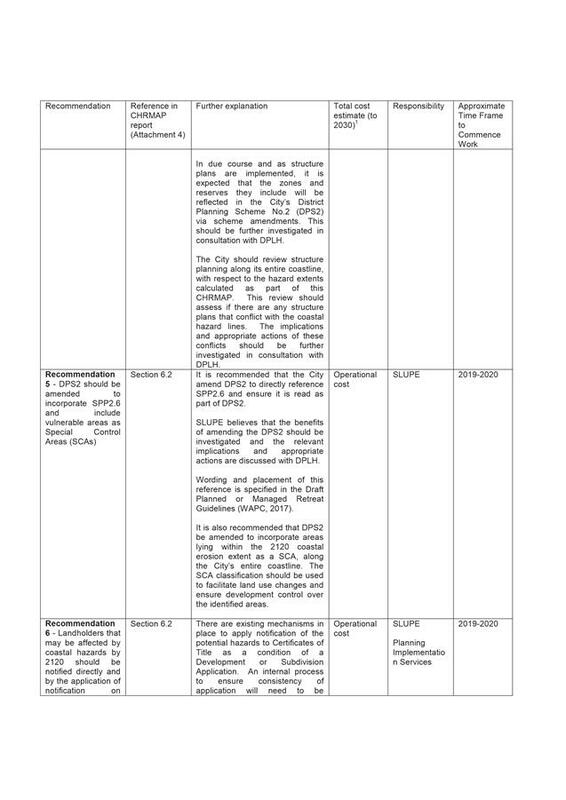 Noelene Jennings, Director Corporate Strategy and Performance declared a financial interest in CR01-08/18 as the report relates to the employment of an acting Chief Executive Officer. Daniel Simms, Chief Executive Officer, declared a financial interest in CR02-08/18 as the report relates to the annual performance review of the position of Chief Executive Officer. 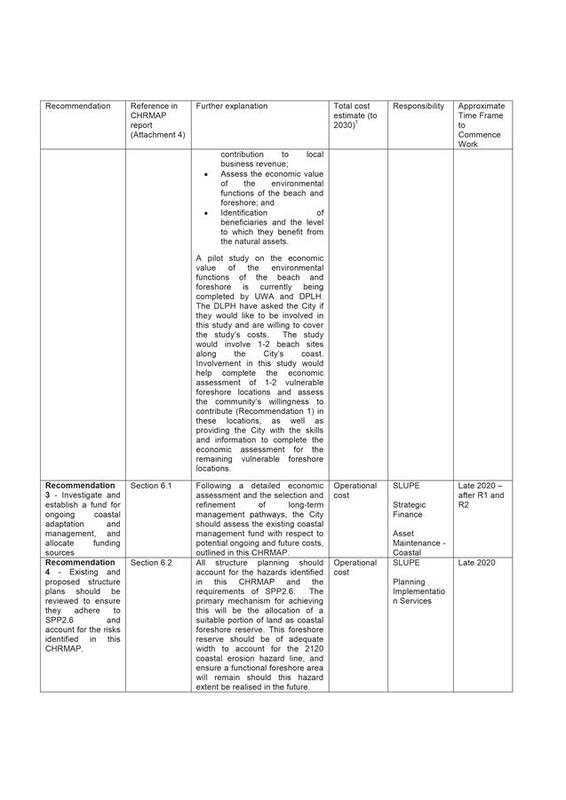 That Council APPROVES the recommendations of the (Draft) Final Coastal Hazard Risk and Adaptation Report as contained in Attachment 1 of this report. 2. 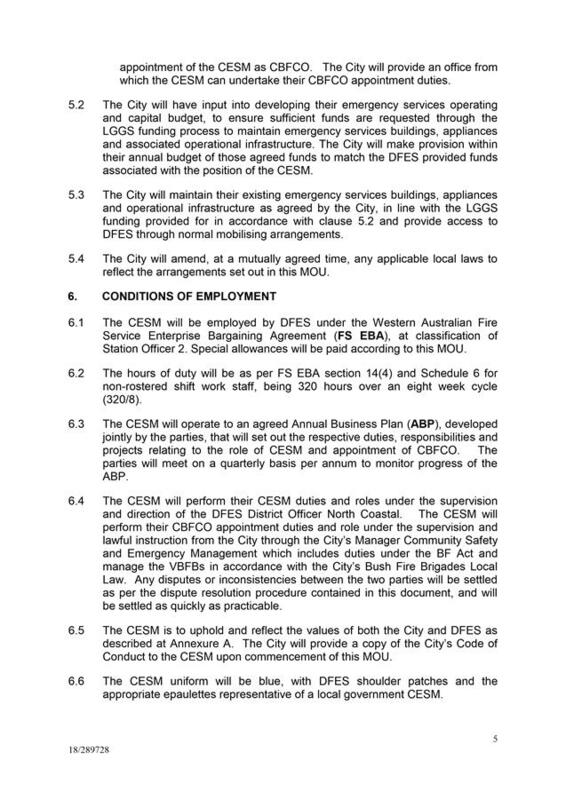 PROVIDES a copy of this resolution to the Western Australian Planning Commission. That the Motion be referred back to Administration to have further evaluation of traffic movements and consultation. 4. REQUESTS Administration to continue liaison with the relevant authorities and to keep the local residents informed. That the report be REFERRED BACK to Administration for further investigation. 5. 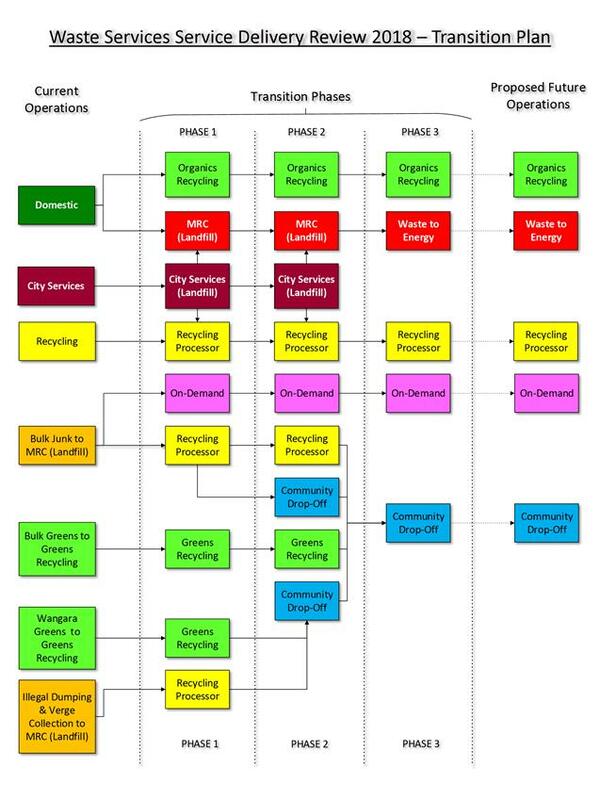 REQUESTS the Chief Executive Officer to commence discussions with other local governments on the possibility of aggregating Recycling tonnages for a waste management facility to process these materials within the City of Wanneroo. That Council SUPPORTS a six month trial from October 2018 to March 2019 for the Wanneroo Library to open on Sundays from 11.00am to 3.00pm to improve accessibility and service for the community. 2. 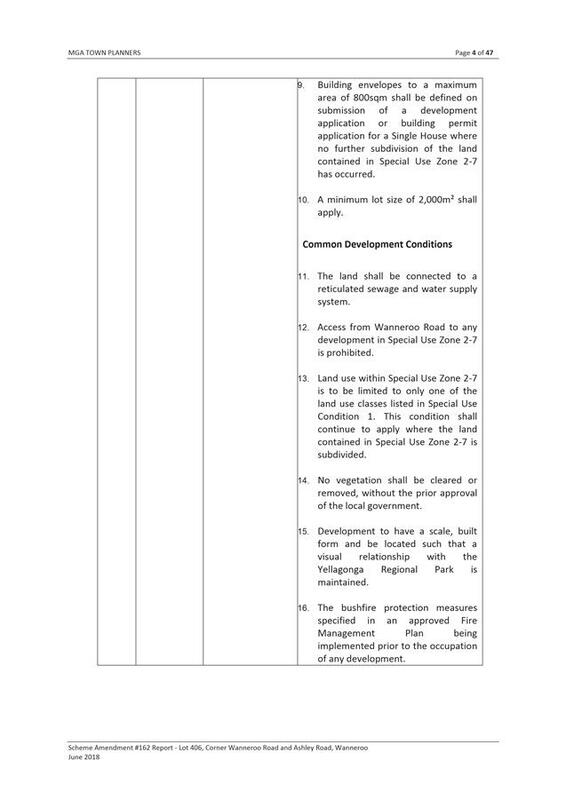 NOTES that construction of the proposed development is estimated to commence by March 2019 and will be concluded in June 2019. 3. RECOGNISES and THANKS the community for its involvement in the community consultation process. 4. 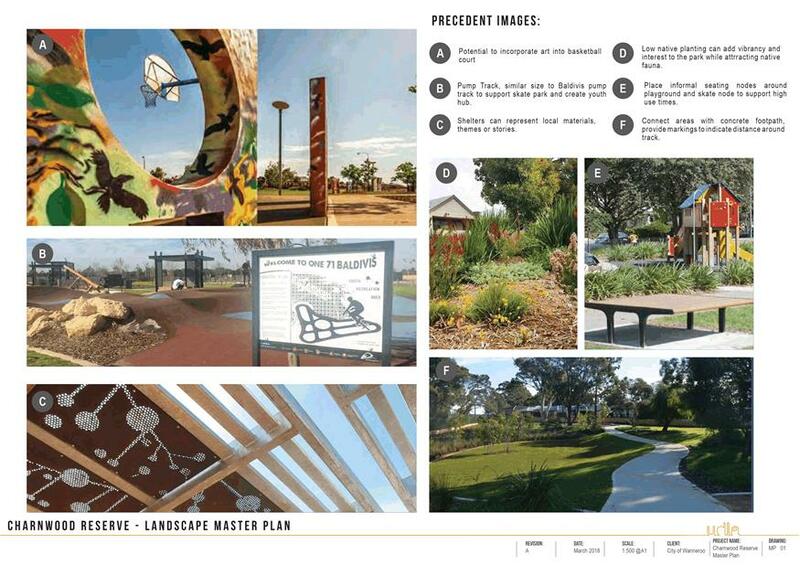 RECOGNISES and THANKS the Wanneroo City Soccer Club for their involvement in the concept design process. 2. 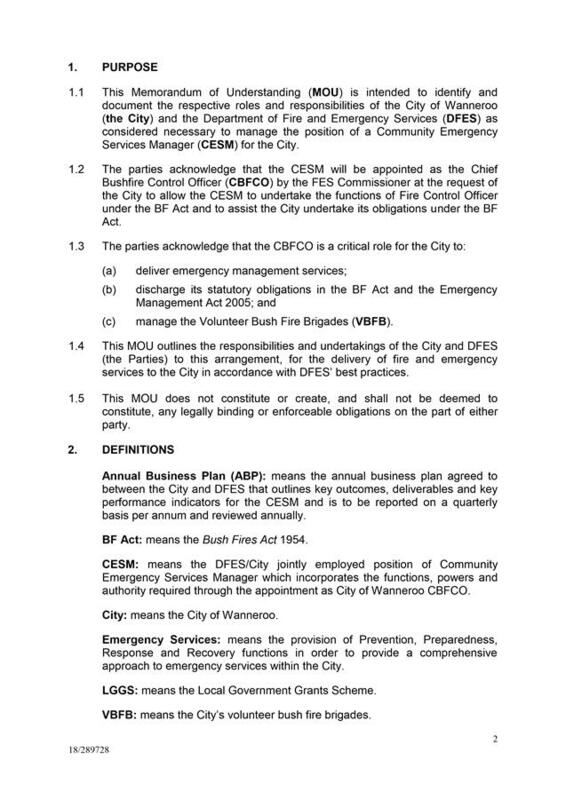 APPROVES the amendment of the Facility Hire and Use Policy, Section 2.3.2 Service and Charitable Clubs and Emergency Organisations, to specifically list the Yanchep Two Rocks Community Bus Management Committee as being eligible for 100% subsidised use of facilities for their regular bookings, defined as monthly Committee meetings and weekly bingo evenings. 5. RECOGNISES and THANKS the community for its involvement in the community consultation component of the project. b. Revise the existing 9.00pm restriction to allow each annual or seasonal hirer up to three bookings per year/season (i.e. fundraising/social activities) where the booking and alcohol consumption can continue up until 11.00pm, with the facility to be vacated by 12.00 midnight. b. No high risk functions permitted at the Centre as per the City’s Conditions of Hire – Community Facilities. 4. RECOGNISES and THANKS the community and Focus Group members for their involvement in the consultation process. 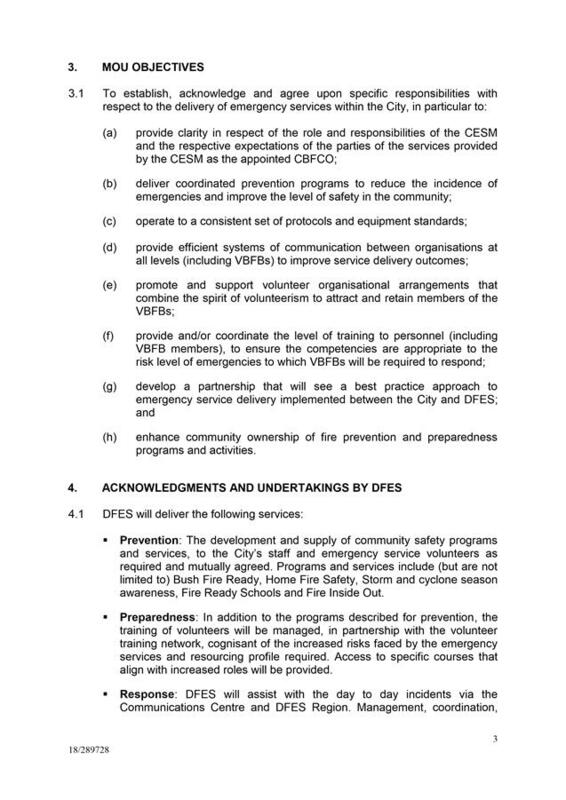 That Council AUTHORISES the Chief Executive Officer to sign the Service Level Agreement for 2018/2019 with the Constable Care Child Safety Foundation. 2. 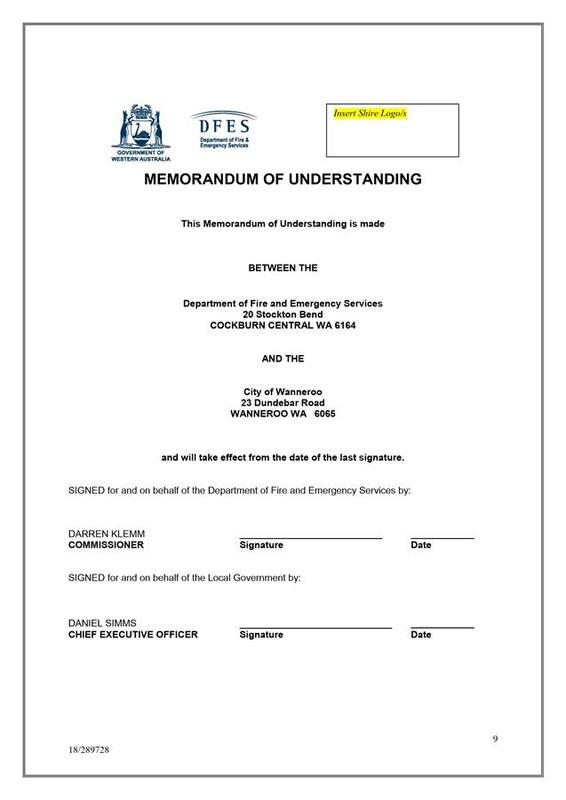 AUTHORISES the Chief Executive Officer to execute the Metropolitan North and East Recovery Group Partnering Agreement for the provision of mutual aid for recovery during emergencies. 2. 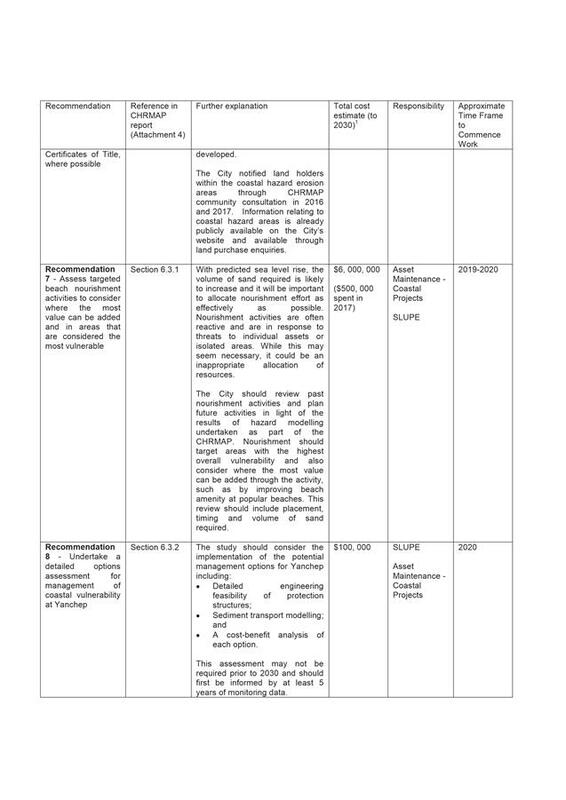 NOTES that the Annual Business Plan that accompanies the Memorandum of Understanding seeks to further address the City’s accountability and governance requirements, and provide clarity to roles and responsibilities and will be negotiated and agreed by the City and DFES within a one month period of the MOU being executed. 3. NOTES that Administration will approach the WA Local Government Association to work with affected Local Governments on defining “exhausted resources” for the purposes of Section 13 of the Bush Fires Act 1954.